Chocolate Teff Porridge | Naturally.Chocolate Teff Porridge | Naturally. 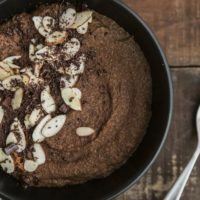 A perfect way to start your day, this chocolate amaranth porridge is rich and filling without being overly sweet. In a blender, combine the almond milk with the protein powder, blending until smooth. Combine the almond milk mixture with the teff and beans from the half of vanilla bean. Bring to a boil, reduce to a simmer, cover, and let cook, stirring occasionally, for 15 minutes. If the porridge begins to thicken too much, add a splash more almond milk as needed. Add in the maple syrup, dark chocolate, and salt. Cover and continue to cook until the porridge is thick and creamy, 3 to 5 minutes. Taste and adjust salt/sweetener as desired. Place in a bowl and sprinkle with extra chocolate and sliced almonds.